The spontaneous self-assembly of silica nanoparticles in water/oil biphasic systems is being employed to construct inorganic protocells with a range of biomimetic functions. The protocells are in the form of colloidosomes consisting of an aqueous interior with encapsulated biomolecules, and surrounded by a semi-permeable monolayer of closely packed silica nanoparticles. Cross-linking of the inorganic membrane enables the colloidosomes to be successfully transferred into water as intact functional protocells. Colloidosomes offer great technological potential in macromolecular storage and for controlling matter transport between internal and external microscale reaction environments. For example, our work demonstrates how inorganic protocells can be used to host cell-free gene expression and enzyme catalytic reactions. Mei Li, David C. Green, J. L. Ross Anderson, Bernard P. Binks, Stephen Mann, Chemical Science, 2011, 2, 1739–1745. A major challenge for the use of colloidosomes as water-dispersible, semipermeable inorganic protocells, is the rapid discharge of small molecule substrates from the micro-compartment that would severely restrict their potential as primitive artificial cells. We are trying to solve this problem by constructing inorganic protocells with a covalently grafted pH-responsive copolymer to generate an ultrathin elastic membrane that exhibits self-controlled membrane permeability for selective release and uptake of small molecules. Mei Li, Rachel L. Harbron, Jonathan V. M. Weaver, Bernard P. Binks, Stephen Mann, Nature Chemistry, 2013, 5, 529 – 536. Self-reproduction in compartmentalized chemical ensembles is a central issue for the development of artificial inorganic protocells. We are studying the growth and division of structurally robust inorganic micro-compartments to provide a first step towards synthetic cell-like inorganic materials capable of chemically induced self-reproduction. Mei Li, Xin Huang, Stephen Mann, Small 2014, DOI: 10.1002/smll.201400639. We also aim to mimic the biological mechanisms of cytoskeletal assembly and organization via the in situ synthesis of artificial cytoskeletal-like structures within inorganic protocell models. For this, we are using functionalized amino acid precursors and enzyme-mediated self-assembly to generate supramolecular hydrogel matrices specifically within the aqueous interior of inorganic protocells. Ravinash Krishna Kumar, Mei Li, Sam N. Olof, Avinash J. Patil and Stephen Mann, Small, 2013, 9, No. 3, 357–362. Khrongkhwan Akkarachaneeyakorn, Mei Li, Sean A. Davis, and Stephen Mann, Langmuir 2016, 32, 2912-2919. Chengli Huo, Mei Li, Xin Huang, Huaming Yang, and Stephen Mann, Langmuir 2014, 30, 15047−15052. Mesoporous silica nanoparticles were also used as surface-active building blocks for the construction of inorganic protocells to produce enclosed inorganic membranes that exhibited type IV N2 adsorption−desorption isotherms, high molecular adsorption capacity, and interfacial catalytic activity. 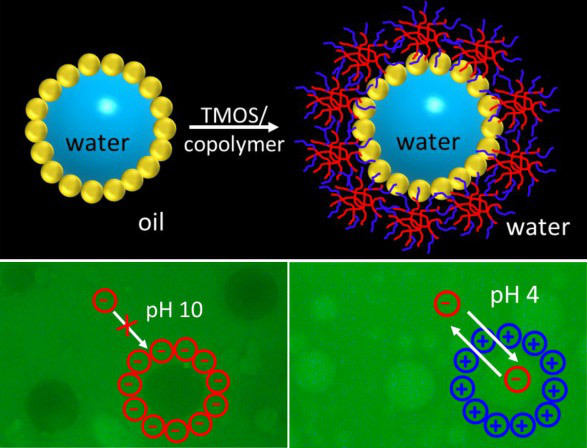 Oil-soluble and water-soluble dyes could be sequestered into the assembled nanoparticles and stored or exchanged to produce protocell membranes with dynamic host−guest properties. The in situ reduction of [AuCl4]− ions adsorbed into the mesopores of the silica nanoparticles was used to prepare catalytically active inorganic microcompartments.